U.S.-Russian public health cooperation has led to extraordinary achievements, from the development and production of the Sabin polio vaccine to the eradication of smallpox. But the full potential of this collaboration has not yet been achieved. U.S.-Russian public health cooperation has led to extraordinary achievements, from the development and production of the Sabin polio vaccine to the eradication of smallpox. But the full potential of this collaboration has not yet been achieved. Deeper bilateral engagement could drive innovation and economic growth for both countries and the world. Unlocking this latent power requires leadership, resources, know-how, and strong institutional foundations. The U.S.-Russia Bilateral Presidential Commission’s Working Group on Health can play a central role in deepening U.S.-Russian health engagement. To support the commission’s work, the Carnegie Endowment established the Public-Private Task Force on U.S.-Russian Health Cooperation. Subcommittees on strategic resource allocation, healthy lifestyles, science cooperation and technology transfer, and regulatory convergence and harmonization contributed to the task force’s work. The task force issued a set of overarching strategic recommendations that cut across these four areas of focus, as well as specific recommendations in each area. Transform the relationship into one of equal partners. 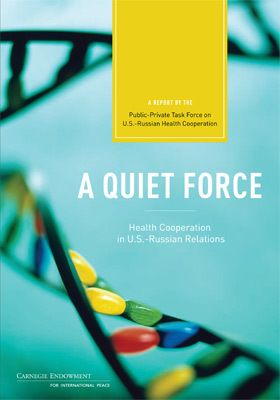 Russia and the United States should move past their post-Soviet donor-recipient relationship and address global health challenges as equal partners. Find areas where interests align. Focusing on issues that affect multiple stakeholders, such as noncommunicable diseases, will attract the resources and know-how to advance the relationship. Maintain the momentum of cooperation. Collaboration on a regular basis, not just during times of crisis, will help ensure effective responses at critical times. Recognize the importance of Track II activities. Facilitating interactions such as peer-to-peer exchanges will build relationships that can produce real outcomes. Encourage public-private cooperation. Collaboration across sectors will generate the optimal combination of political leadership, technological know-how, and resources. Take advantage of regional- and state-level strengths. Establishing cooperative relationships at the state level in the United States and the regional level in Russia may help accelerate progress.